Article 22: Russia 1866 1 Kopeck Value A gorgeous stamp. Here are a few detailed scans showing printing variations and plate varieties. Article 40: Russia 1866 3 kopecks I show a fews specimens of this beautiful stamp. Article 62: Russia 1917 Issues Here is a selection of Russia 1917 stamps. I include a main page with linked thumbnails, and pages for each group: the 20 kopeck, 50 kopeck, and I Ruble values, the 5 Ruble and 10 Ruble values, and the 3,50 Rubles and 7 Rubles values. Article 84: Russia 1880s 7 Kopecks, and a statistics example I show here the four major types for this stamp. Quick links: main page / Stamp list for all 48 / Group One: Stamps 1 to 8 / Group Two: Stamps 9 to 16 / Group Three: Stamps 17 to 24 / Group Four: Stamps 25 to 32 / Group Five: Stamps 33 to 40 / Group Six: Stamps 41 to 48 / Selections from sections of the stamp: crown for selected stamps between 4 and 16 / 19 to 32 / 33 to 47 / eagle for selected stamps between 6 and 20 / 21 and 34 / 35 and 47 / Numeral seven showing various types of background shifts and wear of plate for selected stamps between 1 and 16 / 18 and 29 / 32 and 40 / Selections from stamps with various line breaks / background shifts / Lower legend selections. 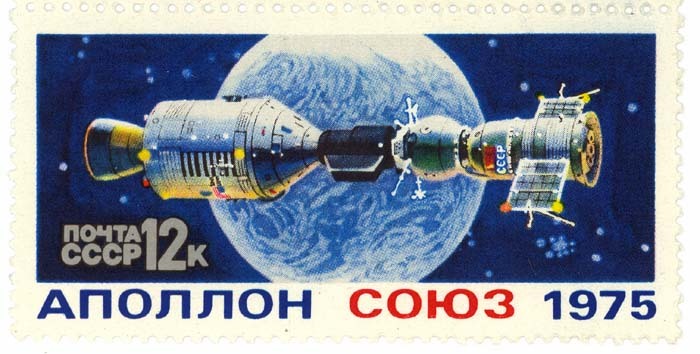 Article 198: Russia Apollo Soyuz Issue This international space collaboration set the stage for the International Space Station. Article 312: Russia Semipostals These stamps date from the early 20th century and have bold colors. Article 322: Russia Flowers Souvenir Sheet Four flowers are shown on this souvenir sheet. Article 340: Russia trucks souvenir sheet Three trucks are featured in this souvenir sheet.